After finishing off my two delicious lobster rolls I went for a scoop of ice cream from the Blue Marble ice cream cart. I have an endless appetite as you can tell, haha...and I'm never too full for good ice cream. Blue Marble is a super cute ice cream and coffee shop with two locations in Brooklyn - one in Boerum Hill and one in Prospect Heights. Started by two friends joined via Craigslist who are devoted to locally sourced and eco-friendly ingredients - Blue Marble ice cream is made on a Hudson Valley farm by a third generation ice cream maker, Matt White using premium grass fed organic dairy and organic sugar. At the Brooklyn Flea in Dumbo on Sundays they have an ice cream cart serving up select flavors. Today I chose the cinnamon since I've never had cinnamon ice cream! It was rich and creamy with specks of cinnamon. 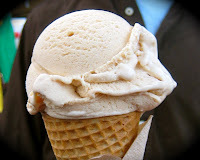 Blue Marble ice cream is for true ice cream lovers, reminding me of traditional 1950's style ice cream parlor ice cream. Too bad it doesn't come at 1950's prices. At $4 bucks a scoop - it certainly is on the high end. Just take comfort that you are supporting the local farmers! A/C/G at Hoyt-Schermerhorn, 2/3 at Nevins, F at Bergen, 4/5N/R/B/D at Atlantic Ave.
2/3/4 at Grand Army Plaza, B/Q at 7th Ave.
Sunday at Brooklyn Flea in Dumbo.